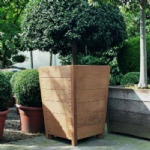 Hardwood large planters from potstore.co.uk. We only use certifed tropical hardwood, that is legally harvested and durability class 1, for the manufacture of our planters. This ensures that they are both environmentally sustainable and also offer a warm and inviting appearance. Because hardwood offers excellent durability, no additional treatment is required. These planters are constructed using stainless steel fasteners and the inside is wrapped with an anti-root fabric. It is possible to create custom sizes on certain models in this range.